Tickets seem very likely to sell out for most of the cities on the fall 2012 version of The Unchained Tour, so I’d recommend reserving seats as soon as possible. That’s especially true for Savannah. If you’re not familiar with The Unchained Tour, it’s an evening of storytelling and music conceived by novelist George Dawes Green to spotlight independent bookstores in the South. George created The Moth, which has been a sensational success — first as individual performances and later as a public radio show. Check out this recent six-minute video that I’ve posted before, including George Dawes Green, Wanda Bullard, Dan Kennedy, Kate Pierson of The B-52s, Peter Aguero, Elna Baker, Joan Juliet Buck, Michael Trent and Carey Ann Hearst of Shovels and Rope, Edgar Oliver, and a number of other folks. Neil Gaiman, an internationally acclaimed author of four novels and the recipient of the Hugo Award, Newbery Medal and Carnegie Medal in Literature, among other prizes; Mr. Edgar Oliver, Savannah-born playwright and raconteuring star of the Edinburgh Festival; Peter Aguero, a multi-talented artist currently hosting The Moth and leading NYC’s improvised storytelling rock band, The BTK Band; Rachel Kate and Joel T. Hamilton, two talented Charleston based musicians—music made with hands and feet, chords and teeth. Neil Gaiman has a huge following and commands really high speaking fees — he’s certainly an amazing get for The Unchained Tour, but I fear a ton of folks are going to be disappointed that they won’t be able to attend the relatively small venues. An additional storyteller — presumably a woman — is TBA. $20 tickets for the Savannah show are currently for sale at The Book Lady Bookstore and E. Shaver Booksellers. Click here to purchase tickets online. If you’re interested in other stops on the tour, click here for the event listing with relevant links on The Unchained Tour website. 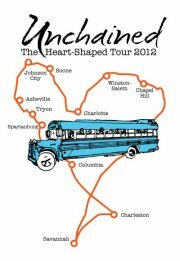 Click here for my review of the winter 2012 version of The Unchained Tour.